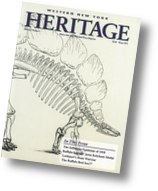 Our look back over the past 20 years of Western New York Heritage magazine continues with a survey of some of the many architecture-related stories that have graced our pages. George Kennan's captivation with travel and Russia led him to expose the horrors of the exile system. Just southwest of Medina are "the remains of one of the most interesting ancient earthworks in the State." Archaeological findings over the past 40 years have reinterpreted the roots of this Indian site from early America. While cobblestone masonry isn't unique to Western New York, about 75 percent of cobblestone buildings in the country are within 75 miles of Rochester. Not limited to one design-style, the cobblestones in Niagara and Orleans counties show impressive variety. The future looks promising for this regal opera house, once central to life in Medina because of its exciting performances and events.